So many students jet off to different places around the country when going to University, however I decided to live at home instead of living at an accommodation near my university. There are many reasons why I didn't move to University. For starters, my mum didn't want me to leave, and I didn't want to leave my mum. Two summer's before starting university, I went away to NCS and even after the first week, I just wanted to go home and be with my mum. I've never had to be away from her for a long period of time and I couldn't even begin to imagine living in a completely separate place from her either. As well as this, I also have a boyfriend, and we're in a committed relationship meaning I didn't exactly want to leave him either. I struggle not seeing him for a few days, so not seeing him at all would probably kill me (It wouldn't, but I would definitely be a mess). So here are a few things I experience as a student from living at home, and a few things I haven't and won't experience. I don't even want to imagine how much money I have saved by living at home. By living with my mum still, I haven't had to find money for rent, and in the area where I live, renting is so expensive! I also haven't had to pay for any bills (apart from my car insurance and fuel), and my mum pays for the food etc. All I need to do is pay her rent which is nothing compared to what I would have had to pay if I moved to University. Compared to some class sizes, my University has probably one of the smallest. On my BA course, in the first year there were 8 of us. Now into my second year there is 6, maybe less which is insane but rather useful! With the FDA course, there were 20 of us in total I believe in our first year, which has now gone down going into our second year. By having such small class sizes, we're able to have regular 1-1's with our lecturer and extra support if we need it. Although I don't have the independence which other students have from moving away to University, by handling my own rent, bills and food shopping. Although I'm very independent in my own home and if my mum asked me to go do the food shopping on my own for all of us, I'd be able to do it. I wash up, do the washing and house work anyway, the only independence I do not experience is living on my own. However, I know many students who have their parents to do everything for them, and that's where some issues may arise. One aspect I am so thankful for from living at home, is not drinking every weekend. I have a friend from University who lives at the other University which is part of Anglia Ruskin, and he drinks every single weekend with all of the people he lives with, which is crazy! Not going to lie, alcohol is very tasty, but I have never been a drinker or someone who goes out clubbing, so I'm glad I'm not experiencing this. One aspect I love about living at home is the relationships I can still build from having such a small class size. Although our course is very clicky and quite odd at the same time, I have built some strong relationships even if they don't live with me! A healthy lifestyle is something every student struggles with when studying away at University, Deliciously Ella can also agree to this! Which is how she started "Deliciously Ella" in the first place. While paying for rent, food, bills and everything else when living at University, being able to buy the healthiest options can be very difficult when trying to stick to a budget. That's the great thing about living at home. My mum pays for our food and she tries to have a healthy lifestyle just as much as I do, so we're able to choose what food we buy and whether we make dinners from scratch, or just something which needs to be thrown into the oven for 30 minutes. If I were to live at the University halls for my University, it would take around 1 hour and 30-45 minutes on a bus to get to the University. However, by living at home, on a train it took 22 minutes, however I also spent 20 minutes walking and 5-10 minutes on a bus from the train station. To work around train times and when I had to be at University, it would take 1-1.5 hours of travelling just to go to University which is ridiculous. However, now that I have passed my test, it will take me 30 minutes minimum to get to my University, and 45 minutes to an hour max if there is a lot of traffic! I'd much rather be sat in a warm car then walking through the rain too within that hour. I also hated getting on a train on my own, I had some horrible experiences and I'm glad I don't have to experience them again while travelling to University. I'm sure your liver is thanking you! 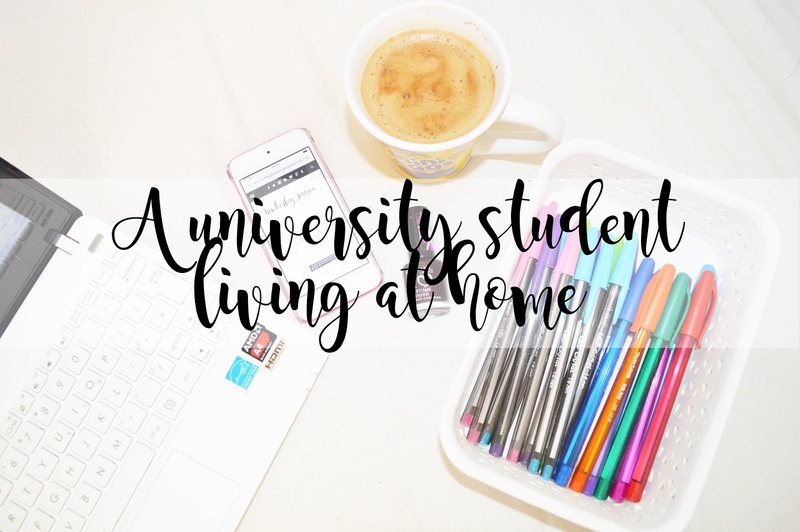 I'm an OU student, so I live at home and do all my studying at home (except for tutorials) and I think I prefer it to the idea of living in halls. I guess the fact I already live on my own helped, I don't think I could adjust to halls living. What a great post - it might inspire more people to consider living at home! I stayed at home as well! The coach took about 45-60mins to get in but the student tickets were so so inexpensive compared to living in halls in order to be 5-10mins away! Living at home has so many perks, and I'm so glad I stayed at home during uni! x.x.x. It's a long time ago now, but when I started at uni I lived at home. I found the long commutes to uni exhausting and eventually moved in with a friend closer to the city centre. I left uni after a year and a half because I just didn't feel like I fit in. Sadly, I do put this down to not getting involved enough with the other students - I was too distant. But I think everyone has to try things out and do what suits them! This is very reassuring for me! I'll be starting university next year but will be living at home!